This is my fourth year with my natural hair. And when I talk about being natural, I’m not talking about something that needs applause. For me, and for many of my peers, having natural hair… is simply who we are. It’s like having an arm. As much as I applaud the overdue recognition of natural hair in the media, I’m a tad uncomfortable with it. In truth, we have been taught to think that natural hair isn’t natural. And that it is “brave” or worse. So here we are. In the continuation of this series, along with my friend Maia, I want to crack the door into the lives of friends, strangers, women. With Maia’s photography, we hope to let in some light about how natural hair is simply, them. You. Me. Brooke is a mother and artist, with an exceptional eye and warm spirit. She is confident and sweet and today she is sharing more of her story. There are so many reasons to “go” natural, although a more accurate term would be “stay” natural, if you really think about it. 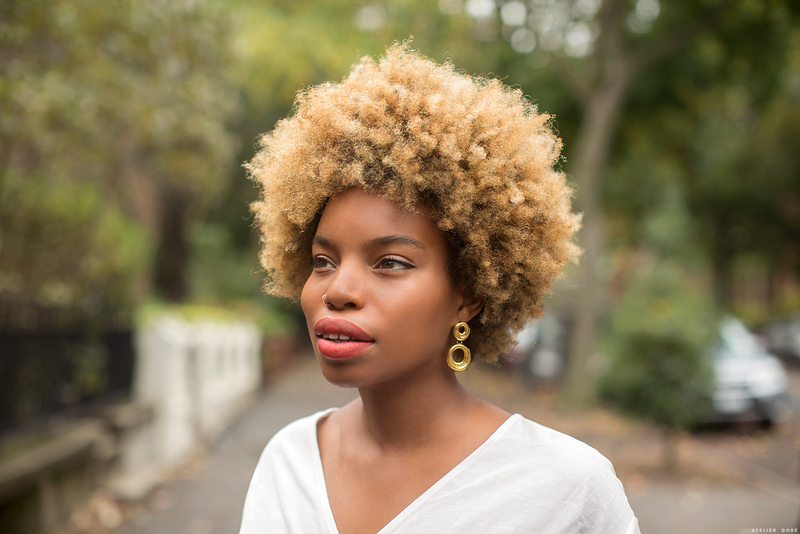 Keeping the natural texture of your hair is more of a non-act than a proactive decision—though for many it has become a highly political gesture, a defiant stance in direct conflict with the status quo. For me, it really was born out of laziness. I just got tired of spending all of that time and money in the beauty parlor. Plus all of the maintenance just took too damned much time! So, 25 years ago, I let a friend cut all of the relaxer out of my hair and I haven’t looked back. On the one hand, it’s just a style, one choice out of many for how I might wear my hair. But there are reasons beyond style too. It can be seen as a eco-conscious decision, as the natural products and lack of chemical straighteners is most certainly better for the Earth. And then there is, of course, the Black Is Beautiful aspect of an afro. But really, the only true way to answer is to say that a person should go natural if it makes them feel more like themselves, end of story. 2. Run me through your hair routine: what products are your favorites, what techniques do you use, what are your best secrets? My hair routine is fairly minimal, but it’s been consistent since the day I cut the relaxer out of my hair 25 years ago. I take a shower every morning and condition my hair with a light moisturizing conditioner. Right now I’m into Aubrey products because they are all natural, not too heavy, and available at Whole Foods so I can restock when I’m buying groceries. After towel drying, I use a bit of Dr. Alkaitis Organic Nourishing Treatment Oil for extra moisture, then just style with my fingers. Once a week, usually on Sunday mornings, I shampoo and deep condition (I’m currently using Davines Nounou Nourishing Illuminating Cream), letting the conditioner soak into my hair for 15 minutes or so before I go at it with a comb. Once the week’s worth of tangles are gone, I rinse out the conditioner, oil up with some more Dr. Alkaitis, style with my hands, and I’m good to go. I’m basically lazy and secretly wish that I had the energy to experiment a bit more; but I am a creature of habit above all else, and these habits suit me nicely. 3. What does your hair say about your style? What does it say about you as a person? I am trying my damnedest to live a life in which I am true to myself. Letting my hair just be is part of that. I’ve never been into preening, so this style, which takes about three seconds to pull together each morning, is the perfect choice. Does it say that I’m a slightly lazy, idiosyncratic, colorful, particular, natural person? Maybe. The one thing I really hope it says—to my daughter, especially—is that it is ok to look just like yourself, even if that means you don’t look like anybody else. 4. What the number one question or comment you get about your personal style? People always, always respond to my hair first. When I first started wearing it natural, you didn’t see a lot of my kind of freestyle afros walking around. Most folks assumed I did some kind of curling or shaping or chemical treatments. These days it’s much more “normal”, though people still always want to put their fingers up in my hair. Luckily, I don’t mind all that much! 5. Is there any particular story you hope to be writing with your lifestyle? Once upon a time, there was a girl who wanted to make the world a better place. For a long time, she thought that the only way she could do that was by having a “big” and “important” job; but she slowly realized that the world needs improvement in all sorts of ways. If she could make the people around her happier, that would be a huge step towards the better world she dreamed about. And so she set out to do just that. She’s been hard at work trying to make people feel happy and good about themselves ever since. 6. If your personal style was a song, what would it be? “Let the Sunshine In” by The 5th Dimension. 7. What is your best advice for hair? For style? For life? I think I have to stand behind my good friend Sarah Sophie Flicker when she encourages us all to “let our freak flags fly.” I don’t mean we should all go out and dye our hair purple and wear crazy outfits—unless it comes from the heart. I think, and this goes for hair, style, and life, that the most important things are to be true to ourselves and to be loving and generous with each other. So if you are all about false eyelashes, platform shoes, and sequins, let ‘er rip. But if you love a well tailored navy wool suit, then I am right there with you in celebrating a little well-crafted simplicity. If we could all be comfortable enough with ourselves to allow others to be who they truly are, imagine what a peaceful and supportive world we’d be living in. Thank you so much Brooke. Such a lovely interview, thanks LaTonya! I adore Brooke's natural (earth tones, woven textures, honest beauty) style. But also — can we give it up for that children's art gallery, so cute! Loving her blog too. This made my Thursday commute. I love the whole feeling of being you. I say the is so much. Be true to you and not what society picks on you to change and be about. Sadly many aren't ready to embrace their styles. Speaking of which I love hers so much !!! I am all over he place myself and you know being a natural I haven't got to the point of being obsessed with having the curl pattern like everyone. Plus I still love to blow dry my hair straight one day curly he next it's as she said being you even if you do not look as someone else. I must know where her necklace is from!